You want to ensure your healthcare organization remains compliant with local, state and federal regulations, as well as industry best practices, so you create a compliance committee. Solving potential and current compliance issues — and getting your staff on board with new policies and procedures — is that simple, right? Not quite. Truly effective compliance programs have employees’ buy-in so that they promote the culture of compliance — and to get them on board, your organization and compliance committee needs to function with transparency and integrity so that employees understand the why and how of policies, procedures, decisions and actions taken. Often, a compliance committee forms with the best intentions — and then quickly spirals into a group that bottlenecks and slows processes by creating unnecessary red tape, micromanages others and comes between the chief compliance officer and the executive board. 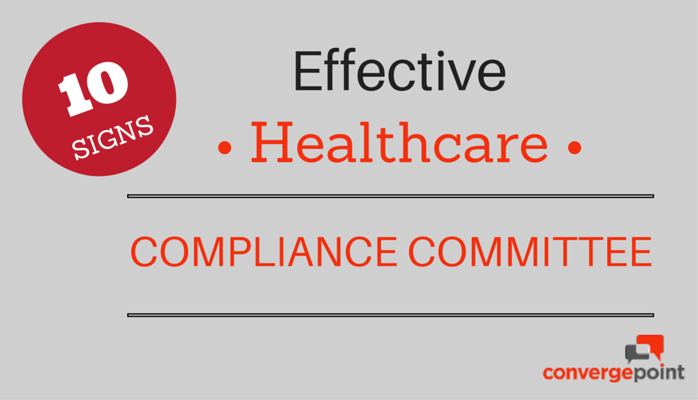 So what does an effective compliance committee look like? It should be led by a chief compliance officer, and made up of compliance and ethics professionals who make up a well-rounded group from various departments. Members should be willing to educate each other and bring ideas to the table. It should not be swayed by the in-house general counsel, human resources, executive leadership or board of directors’ opinions. At the same time, it should have the support of senior management, which needs to be kept aware of ongoing decisions, strategies and topics of discussion. It should have well-defined goals and responsibilities so that it knows what it is and is not allowed to do. It should determine how the company addresses risk management and how the compliance program will operate and be communicated to employees. It should meet on a regular basis, and have set agendas. It should be proactive in creating, assessing and maintaining a compliance plan made up of policies and procedures, and recommend and work with departments to ensure policies and procedures are created and implemented effectively. It should provide methods and systems for reporting and handling compliance violations. It should also be involved in and oversee investigations, reviews and cases, and establish the guidelines for a disciplinary or corrective action plan. When making decisions, it should come to a consensus and present the rulings as a united front. It should help prepare for audits by making risk assessments, looking at your industry, your organization, legal requirements and risk areas. It should prepare reports, strategize and make recommendations on how to improve the compliance program. It should be approachable and accessible so staff members feel comfortable making suggestions and reporting potential compliance issues. It should promote transparency and understanding so that employees understand why and how decisions are made. It should never be shrouded in secrecy, and should have means for sharing information with staff members. When appropriate, compliance committees can even keep managers in the loop during ongoing investigations so they can help keep employees who file initial reports informed on where they are in the process. It should be reevaluated regularly to ensure it stays on track with working towards its goals. The key is to create a compliance committee that stays on target with the original goals it sets forth and keeps the organization’s overall objectives and values in mind. From there, it can weave compliance into your organization’s culture, and develop and use policies and procedures that carry out its goals and for which employees can be held accountable. What’s the next step? Download the FREE guide: How to Ensure Employee Accountability and Compliance through Effective Policy Management. Or, for more guidance on building a healthcare compliance program, get the free eBook: 7 Steps to an Effective Healthcare Compliance Program.